Zoo Welcomes Baby Goeldi’s Monkey! 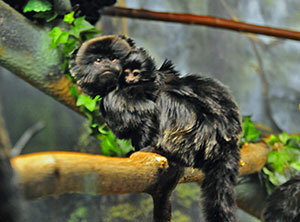 The Milwaukee County Zoo is excited to announce the birth of a baby Goeldi’s monkey, Finn (gender not yet determined). Finn is about two months old now, and, after initially being cared for exclusively by mother Nieve, has successfully transferred to his father’s back for transportation. First-time father JJ is very comfortable with his new passenger, and also very protective. Finn is slowly beginning to brave the branches of the exhibit, and will be seen bouncing around before too long. 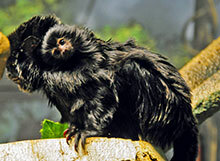 Goeldi’s monkeys are found in the upper Amazon Rainforest region of Brazil, Bolivia, Columbia, Ecuador and Peru. They inhabit the dense undergrowth, meaning that groups are often separated by miles of unsuitable habitat. Their diets in the wild include fruits, insects and fungi. Finn can be seen on exhibit in the Small Mammal’s Building daily.